Very happy with my purchase. Back cushions are comfortable and seat cushion are more firm, but hoping better for overall longevity.Bonus feature is pull out sleeper for extra guests that sleep over. The cushions are terrible! They sink in and become unlevel. Super uncomfortable! Do not buy. False advertisment. The wood unside is dangerious bc the cushion doesnt fully cover the entire wood underneath. Also its not real micro fiber. Its a rough material. Hi Sazeed! I apologize that you are unsatisfied with the Desmond 2-pc. Sectional Sofa with Full Sleeper. If you're having trouble with your furniture, we'd be happy to see how we can help get you issues resolved. I will have a member of our customer care reach out to you shortly! Love this sectional. super comfy and looks great with almost any decor theme. I have a 2 year old and a big dog and it still looks brand new a year later. Very comfortable. Cushions are just right not too soft and the right amount of firmness. The legs are sturdy and hardwood floor friendly. The delivery guys were a little rough but I live on the third floor and there were no damages thank god. Con: The sleeper mattress is a little on the thin/small side but then again it's just a sleeper. Love it. Comfortable. Perfect size. Additionally sleeping is great. Would recommend. Love the color. Most comfortable couches I’ve ever gotten! Excellent customer service, quality furniture. Customer Satisfaction Guaranteed. The sectional sofa is very comfortable and appears to be of good quality. My husband and i also had a good customer service experience with the sales personnel. Highly recommend this sofa, especially if u need one that comes with a pull-out bed. I love the couch. Super comfortable and perfect for our livingroom. The sleeper is perfect for guests. Definitely recommended. This sectional is very sturdy and comfortable. It’s perfect for family and friends to enjoy. We love it best purchase made. Love everything I buy from Raymour and Fanigan. This is my second room of furniture I bought from Raymour and Flanigan and absolutely love everything. Going back for a new dining room set this week. Great customer service. Everyone is so nice. Thank you. Absolutely love our new sofa. Thank you Stephanie. We love the new couch. Looks great in our new apartment! We ordered this sectional for our basement. We received a small discount for Black Friday weekend, and also 12 months interest-free financing (which was the main reason we decided to order it)! It is comfortable and matches our color scheme perfectly. The only complaint is that there is a slight defect on the sleeper bed part, making it a little tough to close, but hey, that’s why it was on sale! Bought this sofa thinking that the material was going to be softer than it is. Feels like a worn denim so yes, it is comfortable, but I was looking for a micro -fiber "like" feel. Still love the charcoal gray color and style. And yes the price is right !!!! I am sorry to say we are unhappy with this purchase. At first we thought it was a great buy. However we have only had it a few months and the cushions have sunk in and become even. The back support cushions are very flimsy too. The chase part seems to be holding up well. So so disappointed. Usually we love raymour and flanigan. Don't purchase this item. Being very honest. Hello Simran, we're very sorry to hear about this experience and would like to look into this for you. Could you e-mail your order details, contact information and a copy of your concerns to rfcare@raymourflanigan.com so we can better assist? Thank you! Do the feet come off? If so, what are the dimensions without the feet attached? BEST ANSWER: Without the feet, the Desmond Sectional Sofa dimensions are L: 116" x W: 88" x H: 34"
does this sectional come with the chaise on the right side? Is the mattress memory foam and how thick? how is the chaise attached to the sofa once in home? BEST ANSWER: A reply has been sent directly to your personal email address including the connector instructions. Please contact Online Sales at 866-383-4484, option 3 for additional product details. Don’t waste your time! I bought this last year and the sectional is falling apart the stiching is loose! I bought the warranty and Its been a nightmare! The whole frame is pushed out so your sitting on the sleep which hurts the bottom after a while! Good luck! The last seat on the couch is actually attatched to the chaise so the couch connects together sliding in with slants easy. It slides into a bracket. Super easy to attach or detach and it stays in place no problem. The chaise has a metal clasp that connects to the sofa. Very easy to connect and sturdy! There are brackets on the side that hook together. Very secure. I understand from previous questions the door width should be 32' wide. I also see that the legs are removable. Id like an answer with the legs removed. 32' is WITH the legs on. How many without the legs? BEST ANSWER: Hi Amanda, thank you for your interest in the Desmond Sectional Sofa. I have been informed that the legs of this particular sofa are not removable. It may be possible for the delivery team to get this through a smaller doorway provided that it is a straight shot and there are no turns that are required to get it into the room. We would be happy to assist you in providing a clearer answer but require additional information about the space. Please contact the online sales department at 866-383-4484 option 3. Can I purchase an upgraded foam mattress? BEST ANSWER: Please contact your local showroom or our online sales department, 866.383.4484, option 3, for assistance with mattress upgrades! My home is old and the door width isnt really up to some modern furnitures sizes. What is the minimum door width needed to fit this sectional? What is the seat depth of the cushion? BEST ANSWER: The seat depth of the Desmond 2-pc. 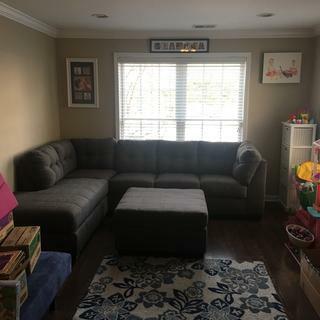 Sectional Sofa w/Full Sleeper is 22". Is the mattress memory foam or inner spring? BEST ANSWER: The mattress is an innerspring. Can i get the dimensions for each piece to ensure it will fit in my house? BEST ANSWER: The Right-Arm Facing Sleeper Sofa measures 80"L x 36"W x 38"H. The Left-Arm Facing Chaise measures 36"L x 88"W x 38"H.
does the arm have storage? BEST ANSWER: The arm does not include a storage area. BEST ANSWER: The back cushions for the Desmond Sectional Sofa are attached. what is the exact measurement from the arm to the floor height? BEST ANSWER: The arm height on the Desmond Sectional is 38". Is matress memory foam full size? BEST ANSWER: The mattress is a full size. Does this come with the ottoman that is shown? BEST ANSWER: The ottoman that is shown with the Desmond 2-pc. sectional sofa is part of the collection, but is sold separately. It makes a wonderful addition to the 2-pc sectional sofa. Is the mattress included with the sofa? What size is it full or queen? BEST ANSWER: The sleeper mattress is included with the Desmond Sectional. The mattress is a full size, measuring 72'' L X 52" W X 4.25" H.
From standing in front of this sofa I want the chaise on the left hand side, what is that called? BEST ANSWER: This is the same method we use to determine dimensions and sectional pieces. When standing in front of and facing the Desmond Sectional, the chaise on your left hand side is called the Left-Arm-Facing Corner Chaise. What is the material and where is this located? BEST ANSWER: The upholstery is made of a polyester/nylon blend. The Desmond Sectional is located for viewing at our Outlet Centers. Please contact 866-383-4484, option 3 for assistance locating a specific Outlet Center closest to you.